As a new pet owner, you must have a question after question filling your minds. Dogs don’t eat the way humans do. And they also don’t eat as much as humans do either. Dogs eat twice a day. Breakfast and dinner! They’ll have occasional treats now and then, but not any scraps from the plates. It’s tough to surpass those loveable wanting eyes, but the most important lesson about being a parent is learning to put your foot down. Although some dogs eat twice a day, other breeds may need to eat less or more. Here are ten tips on how many times a day that owners should feed their dog. 3. What is the Limit? 4. Why Isn’t my Dog Eating? It’s essential that dogs should eat at least two meals per day. However, other breeds of dogs may need to consume more substantial amounts while young puppies should eat a much smaller quantity. Create an eating schedule for your dog especially if they have dietary or medical needs. That way, your dog can study his schedule, and he’ll know when the next time is to eat. Toy Breeds should eat more frequently considering their small size. They should eat about 2-6 times a day. Puppies are a gift. They are also adamant about taking care of as they are young, out of control, and have to learn the rules. Depending on the dog’s breed it’s best to study the exact amount of food to give them. 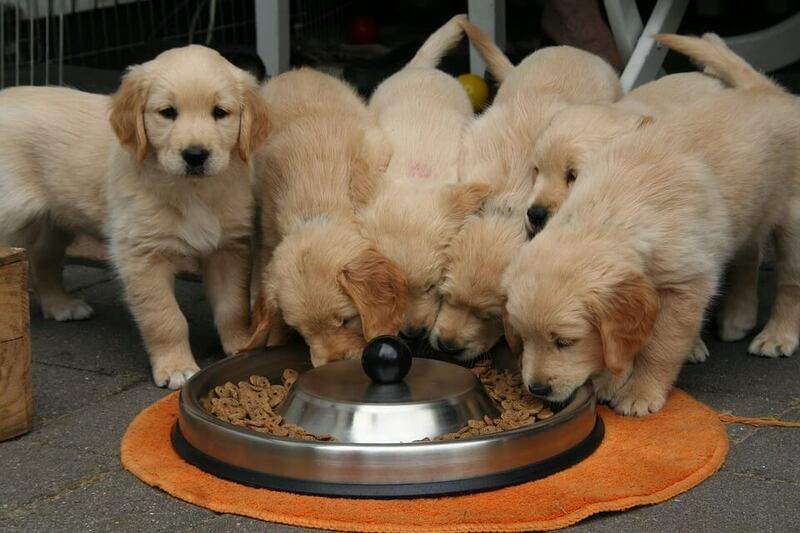 As dogs are growing older, the feeding cycle will become routine to both you and the dog. Healthy adult dogs should eat 1-2 meals a day. It’s okay to throw in a treat now and then. Dogs deserve a sweet treat for being there as supportive animals for their owners. Pet owners should know the limit before the dog gets an upset stomach. As said before their stomachs are not like humans, a dog’s stomach can only handle too much. Leftovers are usually given to dogs so that food won’t go to waste. However, the more dogs are free fed there is more of a risk in obesity. And free feeding will be yet another annoying, terrible begging habit. Talk with the veterinarian to get their opinion of free feeding and how much your dog should be fed in a day. Every dog breed is different. Once nutritional needs and your dog’s health have been discussed, then the veterinarian can create a daily eating schedule. Here’s a tip! Use a measuring cup to measure the proper amount of food to put into their doggy bowl. Don’t force your new adopted puppy to eat. These pups are still getting used to their new home, especially their current owners. Just set their bowl of food on the floor for them and wait about ten minutes. Eventually, the dog will come around and either gobble it in an instant or eat slowly. Once their food has been prepared and set down regularly, then dogs will grow into the schedule and become comfortable. That’s how all humans live their lives through the routine. Having a set eating routine for a dog is healthy as it allows them to learn about scheduling and also pick up a regular eating habit. And with an eating schedule that means pet owners will know when their dog needs to go to the bathroom. Having a routine eating schedule can also keep their metabolism stable and then they have time to digest. Never let your dog’s bowl lying around the kitchen. Remnants of food can become moldy. There also a good chance that leftover crumbs will be picked up by mice. And other unneeded houseguests may be attracted. Always pick up the dog’s food bowl when they’re finished eating and rinse it out. It’s a fact that all humans need to stay hydrated with water. Dog’s, too. Keep a bowl of fresh water next to their food dishes. Unlike how they should eat frequently, dogs should be drinking more water. However, it is possible for a dog to overdrink. If that is the case, then you should also plan out a schedule for drinking water. Never change your dog’s diet without consulting with the veterinarian first. And if you do go about changing their diet, do it gradually until they feel comfortable with it. Leave your dog at peace when it is eating. Dogs hate when they’re interrupted from eating. They are starving. Don’t take its bowl away until you notice that they are done. If you do put your hand in the way, you will be bitten because they believe you to be a threat. Leave your dog at peace during mealtimes. Also, you should keep your dog from rushing; thus there is a higher risk in choking. That’s wonderful to see your dog eating proper food at proper times. But, not all pet owners have this luck. Any dog breeds come with different feeding schedules. When adopting a dog speak with a veterinarian about what you should feed your dog, and how much to give them. Don’t ever feed your dog scraps from this table as this will only become a terrible begging habit and also risks obesity. Be a good pet owner, and also, learn to be strict. Dogs need to know the rules and also have to understand that you are the boss. They’ll only know to back off and stick to their own routinely diet schedule if you’re a good pet owner. Why My Dog Is Limping?